1962 Born in Salvador, Bahia, Brazil. Spends youth in Lavenham, Suffolk, England. 1983 Travels throughout the United States. 1984 Moves to London; works in graphic design. 1985-86 Lives in Portugal for three months and Los Angeles for nine months. 1988 Moves to Los Angeles; works in graphic design and film. 1990-91 Lives in Santa Fe. name James Westwater Recycled Materials. 1993 Sculptures shown at Greenpeace, West Hollywood. Kathy Bryant, "Collected Thoughts," Los Angeles Times, March 6. 1994 One-artist exhibitions at LA Art, Encino and Lulu's Alibi, Los Angeles. first time Corner Square and Oval series precursors shown. Aline Brandauer, "James Westwater at Linda Durham," Art in America, October. 1997 Artist-in-residence and one-artist exhibition at OffSite, Santa Fe. Group exhibitions at Ahra Lee Gallery, New York and SITE Santa Fe. 1998 Group exhibitions at Thesaurus, London and Brenda Taylor Gallery, New York. 1999 New Mexico Museum of Art purchases Pod piece. 2000 Zane Fischer, "The Artist Identity," Arté Magazine, summer/fall. 2001 Receives Robert Rauschenberg Change, Inc. grant. 2002 John Carver, "Plumbing the Depths of Space," Trend Magazine, winter/spring. curates Peace Show at the Center for Contemporary Arts, Santa Fe. Publishes first suite of prints with Santa Fe Editions. Sarah S. King, "James Westwater at Klaudia Marr," Art in America, June/July. Florian Siedel, "Spacemakers," Bauwelt, September. 2005 Retrospective exhibition organized by Rule Gallery, Denver. 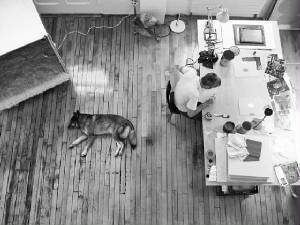 Lannan Foundation purchases piece from Exhibitions 2d, Marfa, Texas. Moves to Beacon, New York. Art, and Exhibitions 2d, Marfa. and Gallery Channel, US, first aired November 23. Rima Suqi, "Gallery Hopping in Marfa," New York Magazine, October 11. Angeles, and Exhibitions 2d, Marfa. Lloyd Alter, "James Westwater's Plywood Chateau," TreeHugger, September 21. Homeless Chateau shown at Hudson Beach Glass, Beacon. Participates in Creative Capital Professional Development Workshop, New York. Founds The Vs culture club, Beacon. Elaine Louie, "Chateau: The Condensed Version," New York Times, June 5.
and Hudson Beach Glass, Beacon. Lloyd Alter, "Homeless Chateau: A Little Privacy," TreeHugger, January 15. "Your Flat-pack or Mine?" Times (UK), April 13. York; first time postcard paintings and multi-piece wall installations shown. Lincoln, pp. 58, 59, 120, 122. Moves to New York; lives in Kips Bay, Manhattan. National Records of Scotland, Edinburgh. Association and Museum, New York, juried by David A. Ross. also teaches art and design from 2012 to 2013. Certificate of Completion Teacher Training, 2012, Texas A&M University. One-artist exhibition at Projects on Ashburn, College Station, Texas. 2013 Artist-in-residence at Foundation OBRAS, Evoramonte, Portugal. One-artist exhibition at Mad Dooley Gallery, Beacon. 2015 Artist-in-residence at Foundation OBRAS, Evoramonte. One-artist exhibition at Evoramonte Castle, Portugal. 2016 Andrea Weber, "Nes Artist Residency," Skagaströnd Review (Paris), March. Academic Excellence Award, Texas A&M University. 2017 Receives Doctor of Philosophy from Texas A&M University. Rebecca Roake, Mobitecture: Architecture on the Move, Phaidon, p. 191. 2018 One-artist exhibition at Martha Van Rensselaer Gallery, Cornell University. Beacon, New York, and Woodstock Artists Association and Museum. Photo credits: Luís Branco, Lauren Camarata, Victoria Cattoni, Herb Lotz, Tom Moore, Naomi Sachs, and Glen Vigus.